Following Round Robin play on Saturday, the eight top ranked teams moved onto the Women’s Open playoffs, while the remaining 4 teams battled it out in the Liberty playoffs. When all the dust settled in the Liberty division, it was the Philly Lady Suns meeting up with NY USAB Girls. These two teams had played together under one flag last year in Philadelphia, and had even joined forces this past season in various tourneys whenever shorthanded rosters necessitated. So these squads knew each other’s tendencies pretty well and knew what to expect. Philly was without their backcourt duo of injured star Megan Griffith and NACBA Top 10’er Ling Lai, so center Taylor Lee (12 pts, 8 rebounds) and SF Sandy Yu (16 pts, 4 treys) would need to provide the buckets for the Suns. As expected, these two did their job against the Warrior zone, and little muncher Shannon Yu dropped in 10, with three trifectas. But it was Cadie Chu’s overly dominant performance that stole the show. She torched the Suns for 25 points & 3 steals, and hit a stellar 15-17 ft’s to ice the game once Philly had to start fouling at the end. Nice job USAB Girls on their 51-45 win. In the Women’s Open Quarterfinals, each pool winner would face a second place team from another pool. Up first was LA Aiya and the Toronto Black Koi. With 5-10 Kimberly Lee and 5-11 Gillian Maxwell, Toronto boasted two collegiate players with the height and skills to carry their team to Monday. Lee can light it up from trifectaland, and with her size she can shoot over anyone. Maxwell’s size makes her a real monster underneath as she is impossible to uproot once she gets position. PG Ann Pastrana is also a solid and speedy ballhandler who complements Lee and Maxwell to the tee. LA would counter Toronto’s lineup with a team of unselfish players who play great defense and can space the court to get open shots. With the Welsh sisters (a combined 20 points) playing the midrange game well, and young Jessica Liang (5 first half 3’s) swishing from the outside, LA’s offense was running smooth. To counter Gillian Maxwell (10 pts) underneath, LA used the swarm tactic to keep her off balance. All-Tourney pick Kim Lee also added 10 for the Black Koi, but LA took this one with ease, 43-31. Toronto CCYAA then met up with the NY Lady Rockits in a battle of polar opposites. New York is a dominant inside team, with Joanna Lau, Tracy Ng, and Diane Wong controlling the glass and keeping opponents from getting any second chance opportunities. 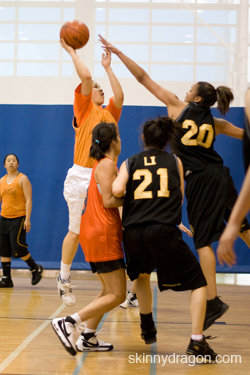 On offense, the Lady Rockits take smart shots and move the ball patiently around. Toronto meanwhile, runs a guard oriented game, with all 5 players able to handle the ball on the perimeter. 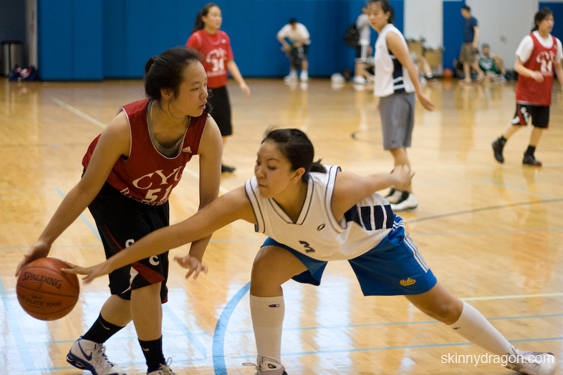 Hoping to create a mismatch somewhere, CCYAA has been effective for years now with this approach. In this game, the speed won out. Toronto advanced easily, 42-15, in one of the least contested games of the weekend. 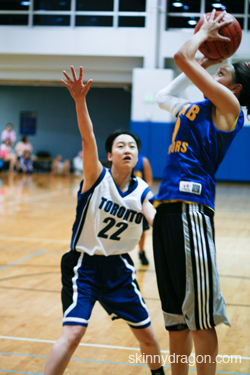 Tracy Ng had 7 points and 5 boards for NYC, while Christine Vuong had 10 for Toronto. Also in the round, was another NY-TO pairing as the Toronto Dragons faced the NY Sabres Blue. The Sabres had unexpectedly knocked Toronto out of a tourney earlier in the year, so both teams knew that this game had the potential for a big upset. With Angie Leung and Niveal Pastrana, Toronto held the edge in the backcourt, but the Sabres defense and team first style always gives them a fighting chance. The Dragons were determined not to fall to the New Yorkers again. We all know that defense wins, and Toronto put it all out there in this one- playing great defense to keep the ball out of Tiffany Lee’s (10 points, 2 treys, All-NACBA) capable hands. Tiffany was only able to score 1 single point in the first half as the Sabres couldn’t get the ball to bounce through the rim. The Dragons kept pushing the basketball upcourt at every opportunity as Niveal Pastrana (24 pts, 4-5 ft, 1 block) had 15 before the midway point. The always reliable Angie Leung (14 pts, 4 triples, 7 assists) provided a sweet second option and the score at the half was 34-6, Toronto. In the second period, the Sabres started to heat up but it was too late to stage a comeback as the Dragons moved to another Final Four with theirconvincing 54-31 win. The final game of the round featured the defending Champion SF ArcAngels meeting the ever improving Washington CYC China Dolls. On paper, it looked like this couldturn out to be a good game, as CYC’s Pui Sham and El Birman have become a steady guard duet and the pickup of 5-10 center Shannon Briggs would be able to address the team’s size deficiency. But Frisco’s experience and athleticism really came to the forefront in this match, as the ArcAngels were able to dictate the tempo with their defense, and get whatever shot they wanted on offense. The ArcAngels raced to a 20 point lead in this one and never had to worry. Paced by the outside shooting of guard Rachel Jung (3 triples), the slashability of Lulue Burton (15 pts, 3-4 ft), and the Swiss army knife skills of F Kelly Tiao (9 pts, 4 assists), the ArcAngels looked pretty much unbeatable. Pui Sham (7 pts, 2-2 ft) and Kalyn Lee (8 pts, 1 trifecta) led DC.